Clothing/Jewelry Description A black jacket, blue pants and white Adidas shoes. 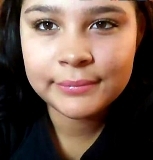 Lisa disappeared from San Gabriel, California on December 7, 2015. Authorities believe she left of her own accord. Few details are available in her case. Updated 2 times since October 12, 2004. Last updated February 26, 2018; age-progression added.